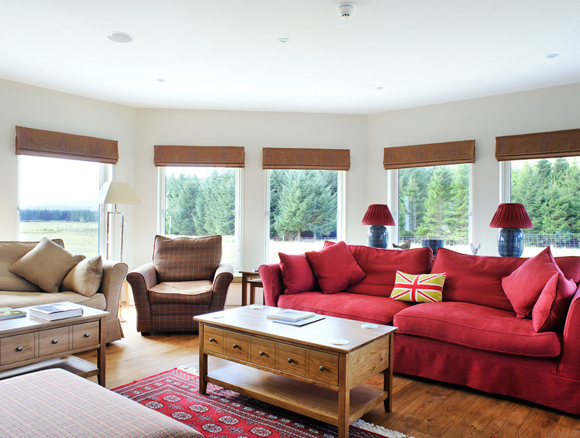 New Kelso combines the comfort of a modern purpose built lodge with some exciting and improving salmon fishing on the West Coast River Carron. 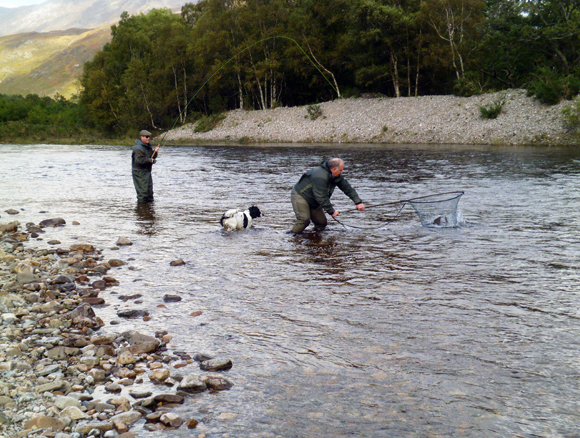 The estate has 2.5 miles of salmon fishing on the private beat of the River Carron with a record total of 197 salmon caught during 2012 season. Fishing is split into two beats, both double bank, excellent access, easy wading and super fly water, making the experience enjoyable for all. The river has a progressive hatchery programme developed by Bob Kindness in collaboration with the University of Highlands & Islands. The house is set in open land so there is great seclusion along with outstanding views to the sea and the mountains behind. New Kelso is just a few minutes drive to the railway station; trains run from Inverness to the Kyle of Lochalsh and Inverness is the station to change trains even if you come as far away as London. The village of Lochcarron, by car, is 5 minutes away where there are bistros and local shops, making the experience enjoyable for all. 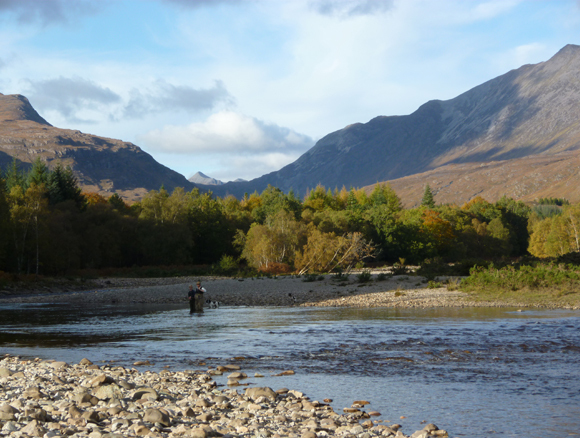 The river has a progressive hatchery programme developed by Bob Kindness in collaboration with the University of Highlands & Islands. The house is set in open land so there is great seclusion along with outstanding views to the sea and the mountains behind. New Kelso is just a few minutes drive to the railway station; trains run from Inverness to the Kyle of Lochalsh and Inverness is the station to change trains even if you come as far away as London. 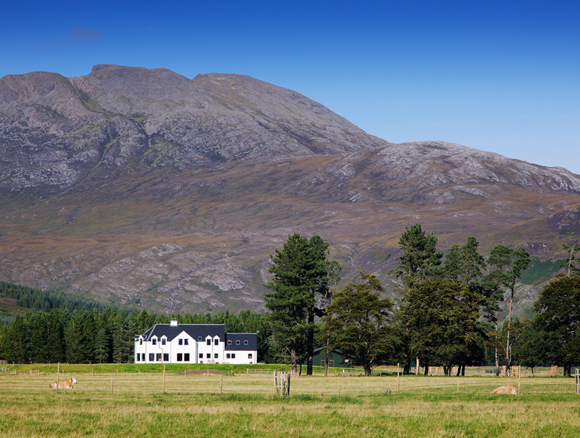 The village of Lochcarron, by car, is 5 minutes away where there are bistros and local shops. New Kelso is a truly exceptional purpose-built large house in a great location. Designed as a holiday house, it is a much loved family home finished to the highest standards. The rooms are spacious and bright, the kitchen is exceptional and the perfect place to gather. There are two sitting rooms with the more formal one benefiting from a wood burning stove and 180 degrees of windows to give a wonderfully bright room with marvellous views. The bedrooms are nearly all ensuite and finished to the same exacting standards as the rest of the house. The house has a ground source heating system making it most environmentally friendly. Outside you will find the “Ceilidh Barn” filled with snooker and pool tables, table tennis, roulette, table football as well as a 58” flat screen TV with surround sound, large wood burner, bathroom and kitchen area. There are two all weather tennis courts (bring racquets and balls).